This winter, come experience beautiful light shows with family and friends that will be an unforgettable holiday trip! From December - January 1, enjoy your favorite holiday songs as you watch bright, festive light shows that perform every 30 minutes from 4:45pm to 7:00pm during Carousel operating hours. Light shows run approximately 15 minutes, every 30 minutes from 4:45p until close! 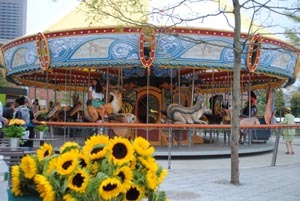 The Greenway Carousel is open Friday, Saturdays, and Sundays from 11a-7p and daily during the week after Christmas from 11a-7p, weather permitting.